Another year, another Resident Evil reboot. This time it’s Resident Evil 4 HD. The zombies are gone and in come Las Plagas; Leon Kennedy’s mission is to rescue the president’s daughter from an unknown fate whilst engaging in sparklingly terrible dialogue. 2011 brings the 6th remake of this fantastic horror-themed shooter to the current gens in supposedly glorious HD – if there ever was a game deserving another peddling to a new market then this would top the list. But how much can be added to an already overly-remade and re-ported classic? The majority of gamers will have at least a base recollection of this game; Nintendo, Sony, PC and mobile markets have all had an adaptation. To get the bias out of the way, the GameCube Resident Evil 4 is one of my favourite games ever made. I have completed it and re-completed it over and over and will continue to do so with every new release. Finishing the infuriating quest to unlock the Hand Cannon will remain one of the proudest moments of my life and I want that on my gravestone. So a HD remix should be a blessing, right? Right?! Well yes and no. As nothing has been added to separate it from the PS2 release, the biggest selling point – apart from it being a proven game – is solely in the hands of the high definition presentation. There is no doubt that the GameCube original looked nothing short of spectacular on its initial release. I was blown away by the opening cutscene and first mission of my first playthrough and the game continued to wow me throughout, with the introduction of all the different characters and locations. Here lies the problem; when a game is already this well-made, there’s only so far you can go with re-rendering and upscaling without remaking the game entirely. Whilst the character models appear to fit the HD tag, some textures look almost identical to 2005, and the sometimes shoddy AI and enemy attack patterns could have done with a review. What’s new in Resident Evil 4 HD? Every line of cheesy throwaway voice acting, every action, enemy placement, and quick time event has remained the same, meaning veteran players will breeze through Resident Evil 4 HD with little resistance; and the big scare moments (spoiler: man in oven!) have lost their impact. A missed opportunity I fear, as even something as simple as shuffling the locations for the treasure hunt side quest throughout the game could have added a bit more mileage – I managed to clock the game in a few hours purely from memory rather than skill. Assignment Ada, the PS2’s Separate Ways and the Mercenaries extras are included to increase the overall playtime, but you really would be feeling ripped off if these were not included. In a case of ‘if it ain’t broke, don’t fix it’, Resident Evil 4 HD’s controls remain almost identical, save for a bit of button placement redesign. A big positive here – after a few missed knife strikes and kicking a ladder over instead of descending it, everything clicked and I was up and running (and gunning). The static, over-the-shoulder aiming may feel a bit dated compared to the modern, FPS cover-based evolution, but the game would not be the same without it and the desperate, ammo-conserving combat would be lost, along with the whole feel of the game. Resident Evil 4 HD remake worth buying? If 1800 points seems steep for a 6 ½ year old game, that’s because it probably is. Do not misapprehend, any version of Resident Evil 4 is fantastic, and had I not previously played it before, I would still be genuinely impressed with the solid variety, well-thought pacing and maybe even the storyline. Although not as shiny, it is still much better than the more recent Resident Evil 5 in almost every way and is far and away the best game in the ever-expanding Resident Evil universe. 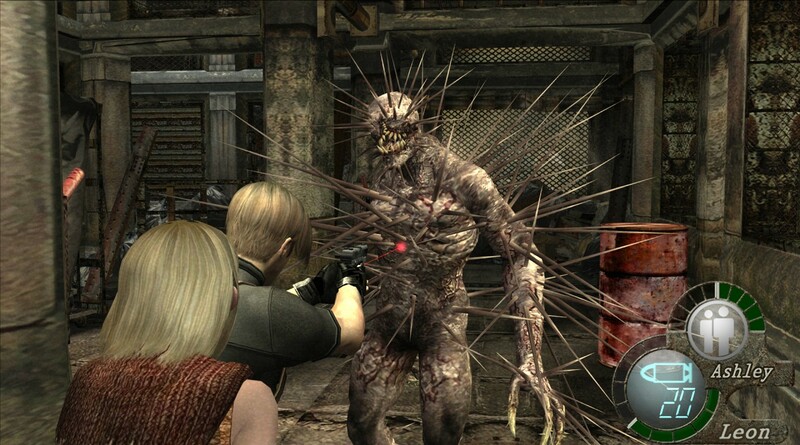 For those yet to have played Resi 4, purchasing Resident Evil 4 HD is a must; it’s simply a brilliant game. For veterans like myself, it’s a lot to spend for a bit of nostalgia and I fear the majority of those purchasing will already own essentially the same game in a non-digital format. An easy 600GP Gamerscore is available for purely completing the main game, and this may have just the same amount of draw to some players as the actual quality of the title. In hindsight, I think I would have been just as happy to have stuck to the ‘Cube. But I still purchased it, as I think many will for the sole reason it’s Resident Evil 4.